Features a 26"-28" multi-scale length, mahogany body with an arched top, one-piece bolt-on maple neck with graphite reinforcement and scarf joint, 12"-16" compound radius dark rosewood fingerboard with 24 jumbo frets and offset dot inlays, Jackson die-cast tuners and AT-1 4x4 (four on top, four on bottom) headstock. when I bought this beauty I knew I made the right choice. 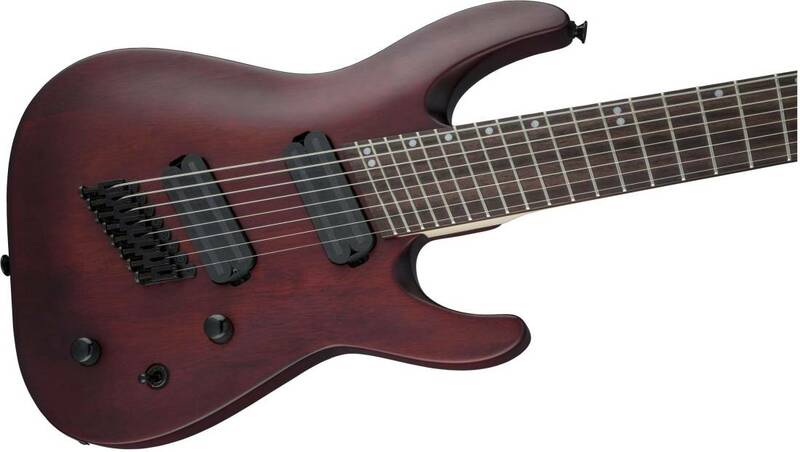 It is my first 8 string and my first multi scale, and the transition from 6 to 8 strings and straight to fanned frets was easier than the transition from E standard to drop D. For the price point this guitar does everything you'd want and more. The strings on it are perfect for F# standard but if you want to tune differently you may want to get different strings. the action feels perfect. the tension is even across the fretboard. the bridge is solid. the finish is beautiful. the neck is incredibly thin which I enjoy but if you like a thick neck then be weary. this guitar is a great investment. if you want to try an 8 string then this is a great choice. not only is this guitar a good beginner's instrument but it makes a great instrument even for a pro.